I’ve been announcing stock car races for 37 years now. And yesterday (Friday, July 6, 2012) was the first time I remember an event that I was scheduled to work being canceled due to the extreme heat and humidity. Dirt track races here in the Midwest are often rained out or they’re canceled because of threatening weather. They’re also canceled sometimes in the spring and fall due to cold temperatures. But, as stated earlier, this is the first time I recall one falling victim to the heat. Much of the country is suffering from extreme heat and a drought. The thermometer around here has been hovering around 100 degrees or more each day for, it seems, a long time. 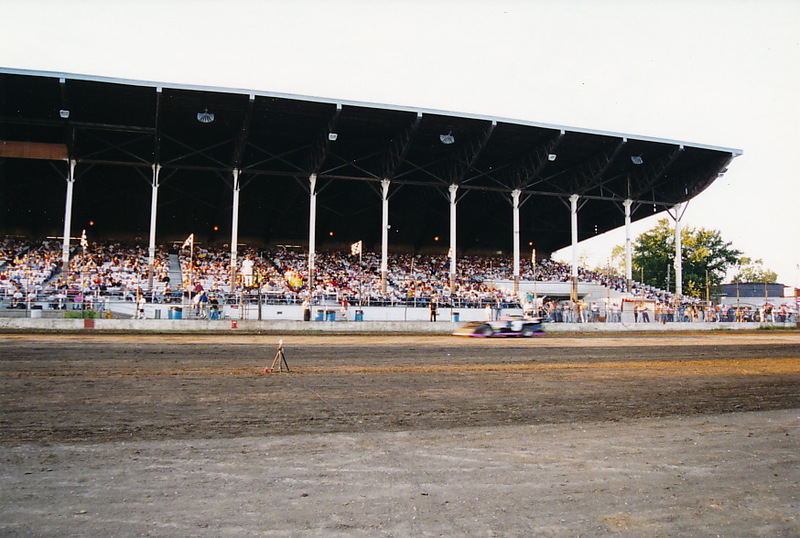 The track where I announce, Davenport Speedway (pictured above in a 1990s photo I took at a NASCAR All-Star Series race), canceled last night’s races around midday yesterday. Hawkeye Downs in Cedar Radids did the same later on. I’m guessing other tracks in the U.S. did, too, and more will do so this weekend. Some will complain about the cancellation. But as much as I enjoy watching and announcing races, I applaud promoter Bob Wagener’s decision. Heat can affect all ages, but I was particularly concerned about folks in their 50s and 60s or older being out in it last night, even if they were just sitting in the grandstand as opposed to working in the pits, driving or officiating. Track firefighters, remember, would have been in full turnout gear all evening. Some of our track officials, including me, are in their 50s or 60s, and some have had heart problems in the past. I’m glad no one was unnecessarily put at risk last night. We’ll all live to go racing again. Copyright 2012 by Phil Roberts, Creative Enterprises. Phil , I for one have a great respect for that call, that they put the lives of many first verses their Profit . !